The topic of death and dying has gripped the publishing world for the past several years. End-of-life decisions, once a taboo subject, are now discussed by groups of strangers at “death cafés.” People around the country have become interested in having “the conversation” with family and friends. Perhaps the Boomer generation is beginning to feel the fleeting nature of its mortality. Or becoming caregivers for elderly parents have caused people to realize they want their end-of-life experience to be better. In any event, there is a plethora of books, articles, videos, tweets, Facebook posts, and other social media instances of best practices for what may amount to the final discussion. At one time people believed the only absolutes were death and taxes. In the current political climate, taxes are fast becoming a minor inconvenience and avoidable by most. Death, however, will come for everyone. It is the one truly universal experience from which no one will escape. 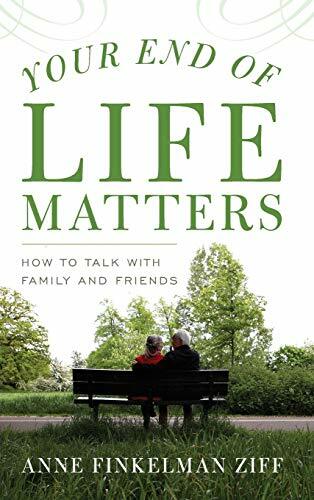 Anne Finkelman Ziff’s new book, Your End of Life Matters: How to Talk with Family and Friends, is designed to assist the reader in developing a personal protocol in approaching end-of-life matters. In particular, this book presents an outline on how to think about “the conversation” and plan to initiate it. The “death cafés” offer someone a dry run opportunity to test out the plan and the ideas. Discussing a person’s end-of-life plan is the most personal and intimate of anything people can do. As a rule, no one likes to talk about death, except in the abstract. It is a difficult discussion and one that, if not handled well, can trigger resentment, fear, unhappiness, and anger. Ziff’s book gives the reader a step-by-step outline of things to think about, issues to identify, and a pathway to proceed. The author’s style is conversational and easy to follow, even if the topics are uncomfortable and difficult. She starts by suggesting the questions one should ask of oneself before approaching anyone else. Ziff is a marriage and family therapist and her books gives the reader a feeling of being in a therapy session. Ziff is the therapist serving as a guide to assist the reader during a difficult time. The book is not restricted to people who are facing death or dealing with a terminal or life-threatening illness. End-of-life discussions can be entered into by anyone at any time and under any circumstances. Ziff’s approach in this regard takes some of the fear and mystery out of the process. And, make no mistake, it is a process. Ziff identifies six questions to answer when planning the conversation, Who?, What?, Why, How, Where?, and When? Discovering the answers to these questions requires the individual to evaluate their personal wishes, dreams, goals, attitudes, and intentions. Readers may find it helpful to view the book as a workshop on best practices. One key point is Ziff’s point “it isn’t inevitable or even essential that communicating one’s end-of-life will be a onetime event.” The author acknowledges that once was enough when it came to her parents. But that may not be true for everyone. It is estimated that 64% of the population has no estate plan in place. For many, there is an aversion to thinking about death. And, preparing a will or trust is planning for what happens after death. The thought frightens people. However, the mimicking an ostrich, head in the sand, look is not only counterproductive, but short-sighted. People often think they have time to take care of things. Too often, they and their family discover that time has run out and no one knows what anyone wants. People like to control their own lives. Ziff’s book points how to do that and it involves thinking about what a person wants and how they want those wants carried out. Ziff fills the book with stories of how other people approached this task. Everyone should be able to find at least one vignette that fits their situation. This is a gentle book dealing with a complicated and difficult subject in a calm and safe way. Planning the conversation may appear to be calculated, but that is the point. If a person only has one chance, it is important to make the best of it. Anne Finkelman Ziff, through her book, guides the reader through the process and provides a roadmap that makes a difficult task almost enjoyable.